Coconuts have been used and eaten for generations, popular amongst their home in the Pacific Islands and South East Asia. They’re a main source of food and the juice has been known as a healthy replacement for sweet drinks for many thousands of years. You’ll know the problem with cracking open a coconut, not easy in the best of circumstances. However, you’ll know that once you’ve got past that hard shell, the soft flesh and beautiful liquid inside makes it worth your while. With WaHiki, we’ve taken the hard work away for you and created a low sugar, high fibre coconut ice cream that will delight your day and give you a time out. We’ve all heard that eating coconut and drinking the juice of young coconuts is especially healthy for us, but what are the good parts that we should know about? Coconut is chock full of vitamins, with Vitamin B, C & E being present to boost your immune system and get your cellular energy firing. It’s also rich in natural minerals, with magnesium supporting your nerve growth and regulating your heart rate, keeping you nicely level. Coconut also contains high levels of potassium, in fact 50% more than a banana! Potassium is great for helping regulate your kidneys, heart and of course your brain. Calcium is also present in Coconuts, meaning you can still get calcium without having to drink milk and making your bones strong. Phosphorus also helps your bones and teeth healthy, and the iron present in coconuts gives your red blood cells a boost. Coconuts are absolutely loaded with antioxidants, you’ve mostly likely heard of them. These special little tools circulate the body hunting for free radicals in the cells of the body. These oxygen free radicals are believed to cause a variety of diseases, including Alzheimers, age-related dementia, heart diseases, and certain cancers. If you want to boost your antioxidants, sprinkle some cranberries, raisins or pecans on top of your ice cream. According to the science, lauric acid is a healthier saturated fat that has a number of health benefits for you, not what you’d expect from a saturated fat! It’s what’s known as a medium-chain fatty acid. This means your body will absorb it whole and use it like a carbohydrate, burning it directly. It’s easily digested by your body, so will fill you up with less calories. Studies have shown it may also help with weight-loss due to making you feel fuller with less. Lauric Acid might also be effective in reducing your triglyceride and cholesterol levels, which reduces the chance of getting a stroke or cardiovascular disease. People who consume coconut over an extended time show a rise in the healthy HDL cholesterol and a reduction in the bad LDL cholesterol. Lauric acid is also shown to reduce the clogging of arteries, known as atherosclerosis, so eating coconut is a healthy way to a better heart! 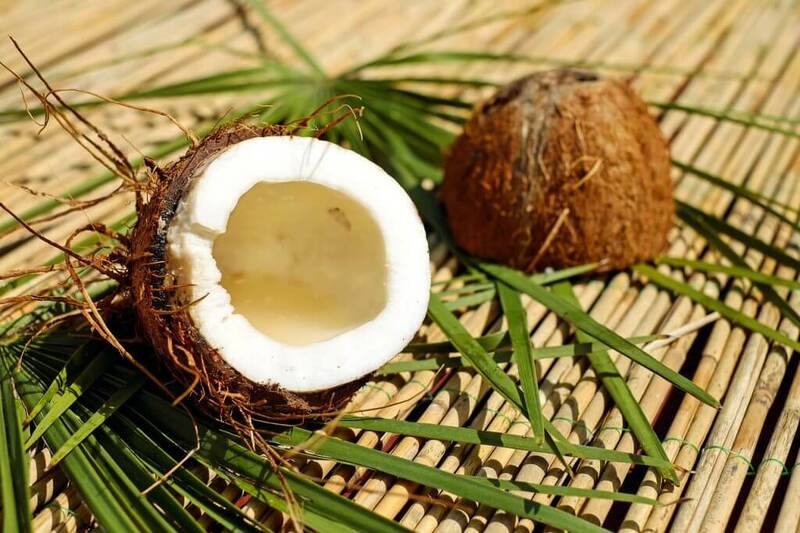 We all know that Coconut is high in fat but it’s the difference between good and bad fats that we’re recognising is the important features of a product we consume. The fats found in coconuts are less harmful to use than the fats found in cow’s milk, making coconut milk a good choice instead of regular milk. Coconut meat is also high in substances known as monoglyceride, which is used by the body for energy rather than being stored in the body. Along with a healthy diet, coconuts will provide you with a ready energy source that won’t stick around. Coconut oil has an anti-microbial effect, which can help to restore damaged hair and reduce acne. With acne, the bacteria in the oil glands increase massively, causing the breakouts we’ve all experienced. By taking coconut, the lauric acid helps reduce these as the acid kills off the bacteria in the oil glands, causing a reduction in the severity and quantity of breakouts. You’ll also benefit from using coconut oil on your hair, it won’t just smell gorgeous, it revitalises dry frizzy hair. Ideal in our summers, keep lustrous hair by working a small amount through your hair. Digesting food can be difficult with the increased sensitivity to ingredients. However, coconut is very gentle to the digestion system, and with a high fibre content, it’ll cleanse it at the same time. Add coconut to your breakfast every day and you won’t need as much (or any) of that high fibre cereal! Coconut meat has more fibre in it than wheat bran and other types of grain. There are about 5 grams of fibre in two tablespoons of coconut butter. Coconut flour contains 7 grams of fibre and coconut meat has about ten grams of fibre in a half cup serving. Do remember that the oil doesn’t contain fibre though! If you choose to drink coconut water, made from young coconuts, you’ll love that it’s quite low in carbohydrates, calories, sugar, and nearly fat-free. Better than any sugary drink, and healthier than many fruit juices. Coconut water has high amounts of protein, vitamin B complex, and ascorbic acid. The meat of the coconut fights oxidation in the tissues and contains many minerals, vitamins, and healthy fat. WaHiki is low in sugar and much healthier for you than old-fashioned ice creams. Coconut is known to help in the secretion of insulin.This is good if you suffer from diabetes or pre-diabetes, yet we do suggest you follow medical advice! Benefits thyroid function: Coconut is proven to not have the storage issues of other oils, which start to break down, oxidising and causing rancidity, bad for your thyroid gland. Coconut doesn’t break down with a shelf life of 3-5 years which reduces the oxidative stress on your thyroid. It’s shown to increase cell membranes and enzyme activity to convert the hormones your thyroid needs. Oil – As a high-temperature oil, coconut is great for sautéing and stir-frying without burning or adding unwanted flavour to dishes. Water – Coconut water is especially great for hydration without the artificial flavours, sugar and extra ingredients found in hydration drinks. With its high potassium, it’s great for during and post exercise. Ice Cream – WaHiki is a great addition to your diet, either for breakfast, snacking or dessert, it’s high fibre, low sugar and great taste means you can add it to drinks or add healthy ingredients to maximise the benefits. Dried Coconut – Dried coconut flakes can be toasted and put in granola or sprinkled on top of yoghurt or ice cream dishes. Don’t forget to choose the unsweetened kind though! Sugar – Coconut sugar can be obtained from many stores, being high in iron and potassium. It can be substituted for normal sugar in the same quantities. Milk – Bring more coconut milk into your diet, it’s a healthier replacement than normal milk, and can be used in drinks, baking & cooking for amazing flavour.